In the Recent Logs section, for found logs or DNFs, the found or DNF icon is shown, but for other log types, the cache type icon is shown. This is confusing right off the bat, but I'd say that the icon reflecting the log type is even more important for the less common log types. The cache type is an interesting piece of information, so fit it in if you want, but I claim that, in a list of logs, nothing is more important than the log type. On another note, I can't get over how ugly and meaningless those tiny little icons are in the Recently Viewed section. I think just the numbers and the cache type without any icons would be more useful: "2.5/1.5/Other". It's not as if the icons help me figure out which rating is which. By the way, thanks for listening. Limiting the Recently Viewed to 5 and tightening each line up made a big improvement. I second what GeoJaxx said. I use the map to view my Pocket Queries all the time. Sure, I can bookmark www.geocaching.com/map... Or, just restore the link on the dashboard, please. Thanks. I totally agree. That was my usual thing I did in this page. For finds and DNFs, the displayed icon represents the type of log. However, a "Write note" has an icon representing the cache type. I haven't seen other logs types, so I can't say what happens for those. Based on what I'm seeing, I think there needs to be two different icons: one for the log type, and one for the cache type. Right now they're mixed together, so it isn't easy to get the log or cache type information quickly at-a-glance. For finds and DNFs, you don't get the cache type information at all, whereas for notes (and possibly others), you have to read the text to get the necessary context. Also the remainder of the log description doesn't distinguish between the log and the cache name, it's just one string of text. Including a link to the relevant cache for each row would be nice. Not essential, but nice. As someone else already pointed out, you can get to the map by going to the "Play" menu at the top of a page and clicking the third option: "View Geocache Map". It's only two clicks and available from any page on geocaching.com. It seems the whole site is going to be changed into some mobile device friendly style, annoying the users of traditional personal computers more and more. Lots of empty space, big fonts renders the so calles dashboard useless in my opinion. Looks like it should resemble some kind of social network, keeping in mind the prominent placement of your geofriends acitvities. Well, absolutely not my cup of tea, like the old profile page much better. I'm glad this is only a first draft as I find the new pages way way too simplified. There is just too much missing from the page, everything from viewing all my logs to the link to the map from my home location is gone. How do you get to Benchmarks from the new page? How do you see your logs? Seeing the log date requires a lot of scrolling. The typeface is way too big which is wasting screen real estate. It's not even got my find and hide count nor my renewal date or the trackables I have in my possession. Maybe keep an improved version of this new page for tablet and smartphone users but for desktop users the old page is far far superior. The website must be designed for easy access to data. Easy on the eye must come secondary to that. Thanks, but that's kinda beside the point... there are other options on the "Play" menu that have their own links in the Dashboard, e.g. Trackables, Pocket Queries, and Drafts. Just saying I would like the Map on the Dashboard as well. - Great update, we now have several watchlistS to play with, thank you ! - Responsive design... look into it, really, it's not too late ! Come to think of it, without the redundant text, there's plenty of room for both the log type icon and the cache type icon. I just noticed that in the Recent Logs list, there's a link to the person, and there's a link to the specific log, but there's no link to the cache itself. The link to the cache itself is the one I want. The other 2 links are nice, but I'd almost never use them. Ignoring the sarcasm in this post, Gillala does bring up a good point here. Is it planned that there will be multiple watchlists? I can't think of a reason why you'd need more than one, so if that isn't what's planned, you can drop the "s" from that label. Also, can you remove the "db_bgimage.png" image from the top of the sidebar? It bumps down the sidebar content for no apparent gain, so removing it would move more stuff back above the fold. I was wrong. It doesn't permanently freeze the browser; it just takes about 15 seconds to load when I click on "Logs," during which time the browser is unresponsive. It's better in Chrome, which has a process per window. Oh, and the settings do not work, but I suspect that is understood. But I am having a hard time comprehending why this kind of abysmal performance is seen as an "improvement." Because of your desire to "improve things " you're just making things worse. First you screw with the old geocaching App by making an inferior one. Now you want to do the same thing to your website. It works just fine. No need to turn it into a clone of your app. I now use another (and far superior) App for caching. It does everything the classic one did and more. Can't stand the new profile page either. The new way you have to post a log is lame. I'll keep going to the old pages as long as its allowed, after that I guess I'll log only from my (superior) App If it ain't broke don't fix it. 2). I understand that "things change" and you guys are making the effort to improve things, and I admit I'm somewhat resistant to change (but am trying to do better), but why did the dashboard/profile changes have to be so *drastic? * Why not just make some tweaks here and there to the old version to improve things users asked for, without *completely revamping* the entire page/feel? I like it being "immediately seen" on my profile page if another user visits it. The reason why they moved the BIO to a separate tab might be that people often encountered (I did many times) profile pages with huge statistics in BIO that were able to freeze the browser for a couple of seconds (I had to wait about half a minute in a few cases). Can't say that ever occurred for me. (Perhaps it would on my cell phone app (? ), but I never visit other people's profiles while using the cell app, only when I'm on my pc browser at home, right next to the wifi modem). Thanks for sharing all of your thoughts! Our team met today to have a quick feedback meeting and will be addressing most of the big stuff that was mentioned in this thread in the next week or so....white space, friends filtering, performance of page, 'About' section, linking to the profile tabs, identifying owned caches with a badge, displaying the status of caches in their titles (disabled, archived, unpublished), and linking to geocaching.com/my/geocaches.aspx for logs. Whew! As an FYI about our release process with these projects you should know that thoughtful, grounded feedback about the problems you are having is what speaks the loudest to us (akin to the tone of the User Insights forums). It loses impact and focus for us when the feedback turns to a general dislike of anything changing. We know that change can be tough, especially when you have been seeing the same pages for many years. Please know that we aren't just changing things for the sake of change. We have technology concerns, we have usability concerns, and we have had requests to bring in new ideas and features from the geocaching community. You should know that even though we geocache, we aren't making decisions based off hunches or the way 'we' like to geocache (believe me, as I was a geocacher before I was a Lackey, that would be awesome!). Everyone plays the game differently and we try to allow for that kind of flexibility when we design features for the site. It is our responsibility to find a good balance between all these things. We will be listening to you all summer long, as we continue to add features and functionality to these two pages. When we hear grounded feedback about the problems you are having we will look for good solutions for them - it won't necessarily mean that the loudest feedback wins or that the solution you have proposed will be implemented, as there are LOTS of factors to consider. When new solutions are implemented we look at analytics and data to see how/if folks are using the features and combine it with the qualitative feedback that we hear here, in usability tests, and in interviews with geocachers to make our decisions. Also, quick note - if you don't see Dave or I as active in a thread on a particular day, we aren't ignoring you. It means that we are reading all the information, recording it, and meeting with the team to prioritize the work that needs to happen. That was me today. Stories have been entered into the backlog and the team will review them tomorrow. It is our goal this summer to review what we are hearing and move in quick iteration cycles to make changes to and build out the pages. We released them unfinished for a reason, because we wanted to build them with you. This is definitely a different development style than you have seen from us, but we wanted to try something new and see how it works. I'll be out of the office on Friday, Monday, and Tuesday - so if you don't see me as involved for a few days it's because I'm out grabbing a few new states. Thanks again for taking the time to explain what you are seeing and feeling with the new pages. It is helpful! I really like your mockup - I would be very glad if you provide a "stable" version of your Greasemonkey script for download (at least at the moment GS forces the use of "the new experience") . We released them unfinished for a reason, because we wanted to build them with you. This is definitely a different development style than you have seen from us, but we wanted to try something new and see how it works. I like this new wind in the development. Great to hear that and thanks for staying in contact, Jayme! Although the one click map icon is now gone I can now see that on a website it is possible to go to play and then click the third option to get the map but that is not user friendly or obvious and surely is part of the old 'look' by using the top banner. However when I open the dashboard on my tablet I do not get the 'learn play community shop' banner at the top of the page so can't get to the link to view geocache map link without opening up a side menu. Having an easily found one click link to a geocaching map on the first page of the dashboard I feel is very important. It is our goal this summer to review what we are hearing and move in quick iteration cycles to make changes to and build out the pages. We released them unfinished for a reason, because we wanted to build them with you. This is definitely a different development style than you have seen from us, but we wanted to try something new and see how it works. Thumbs up for this statement! If this had previously been communicated open and clearly visible (for example in the first paragraph on the new dashboard), there would have been less reason to worry. There are many issues with the old dashboard and reworking it is a good idea, but presenting a beta version without clearly communicating that work is still going on, implies fear that one will be forced to use this unfinished version at will. To be forced to use something that brings (nearly) no benefits, but works worse than before and breaks familiar workflows is what many people angers - good examples are Windows 8/10 and Ubuntu Unity. There are still many people who don't care, but especially "power users" like to have working and well known interfaces. A user will never improve if he regularly looses part of his tools and is thrown back to a former level of learning. This is indeed a different development style than before - think of barely working message center, abandoned Waymarking and Wherigo, feedback forum where highest voted wishes had been ignored, ... - and if GS really cares about the users from now on, maybe there'll be hope again for real improvements. When looking at your Profile, the only Bookmark Lists shown in the Lists tab are the ones you've chosen to be "public". That is what other cachers will be able to see when your profile is viewed. To see all of your lists, whether private/shared/public, then you need to go to the Lists section on the Dashboard - or go directly to your lists page. Yes I see now that on a website it is possible to go to play and then click the third option to get the map but that is not user friendly or obvious and surely is part of the old 'look' by using the top banner. However when I open the dashboard on my tablet I do not get the 'learn play community shop' banner at the top of the page so can't get to the link to view geocache map link without opening up a side menu. Having an easily found link to a geocaching map on the first page of the dashboard I feel is very important. It's been explained that one goal of the re-design is to remove links that are already elsewhere on the page. On a mobile/tablet, you should have access to the top 'banner' links by clicking on the 3 horizontal lines in the upper-right. Do you have that menu icon when viewing your Dashboard page on the tablet? I think that having the dashboard and profile pages more mobile-friendly will help address the app users that want more functionality. For example, app users have clamored for souvenirs and statistics (among other functionaliy) in the app. They can now be pointed to a mobile-friendly webpage. Yep, I've also encountered issues with other cachers' custom content delaying the page load. It could take quite a while before I could click on something else on their profile, and usually that 'something else' was the 'Geocaches' tab. When in the new Dashboard, there is a link to go to your Profile. But when you are in your Profile, there is no link to go to the Dashboard. 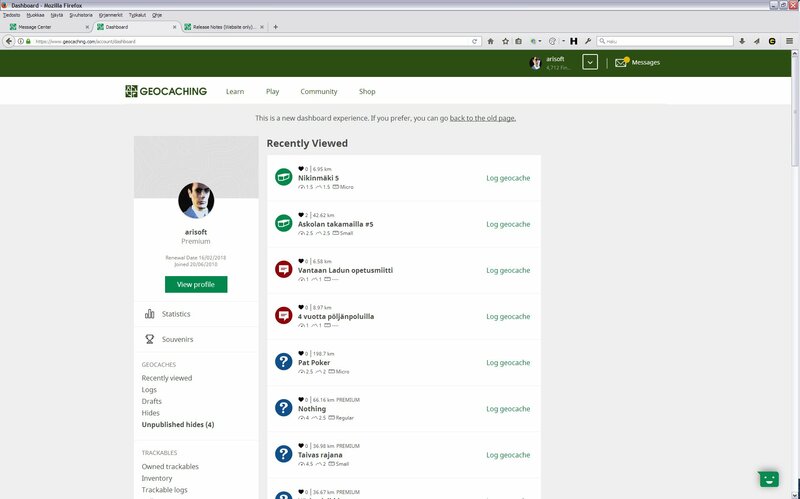 I know you can click on your user name in green title bar and this will bring you back to the Dashboard, but a link in the new profile section would unify the navigation layout. Ah, yes. You are correct that they do show up in the old "dashboard" under "Your Logs." I just never seemed to notice them that much because they are smaller and less in your face so to speak. So much white space makes it really weird looking. But I do see trackables I visited in the new Dashboard. See photo below. Also the two trackables I visited at the cache I found are a few entries below my log for said cache. I don't know if it's always been this way or if I'm just noticing it more now that the spacing is so wonky. My main question would be since my own logs are now combined into a section along with my friends' logs, will I see trackables that my friends visit to caches in this section? I haven't seen that yet, so I'm guessing now. - Big profile photo, lot of empty space above and around. - Recently viewed vs. Recent logs - I can see few of my activities compare to huge report for logs from my friends. I want to see my data not someone else. If I want to see it I can go to search for it. - Add setting where I can configure what and how I want to see (it will solve previous issues as well). - Lots of wasted space. On the right and on the left. And too many lines for the same information in the old design. Everyone has a 21"+ monitor, why don't you use that space? - Get rid of these friend logs. I want to see my recent logs, not from other people. I will use the old design, which has obviously more information and is clearly arranged. We can't you have 2 completely different sets of pages like many other sites have? I don't care at all what a mobile user wants to see (or HOW they want to see it. I way more care about how it looks and feels on a standard wide screen display. And the new look THERE simply is weird, space wasting and there are still some old features/infos missing. A new dashboard looks pretty good, up to recent logs of my friend. I don't want to look at it, is possible to hide it or turn off? Thank you. My main concern is that the "profile" tab is no more the default view, so that all stories and specific stats that we have created to tell something about us is now hidden in a rather invisible "about" tab. Specific stats and storytelling is part of the game. 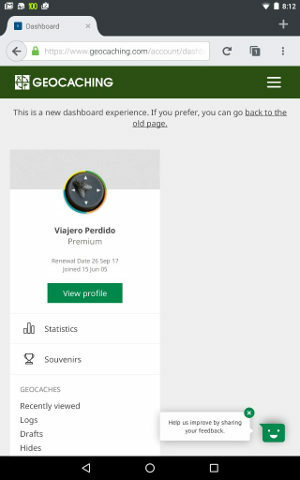 It could be that only a little percentage of all players have customised their profile, but what is this percentage among the serious geocachers (the ones with more than 1000 finds, eg.) ? I'm really disappointed by the new "profile" and hope that a customised profile will find his place back as the default tab. When typing my logs, I have no way now of adding a hyperlink, rather, using Markdown. I often link other caches or something relevant and cute to my logs and feel the writing experience will be lessened if am unable to do so. In the release announcement, photos of the new dashboard were shown, and the blue face next to DNFs were listed along with other categories in each profile. Where did that DNF stat go? Adding coordinates to a log needs to be enabled again. That is an extremely helpful feature when you're looking for a cache that is away from the posted coords. 1) I have seen on my profile page all logs from last month. Now I dont see it and for bigger mess I have there logs of my friends. Why? OK, good idea to see it, but somewhere else. Only worse overwiev. 2) To see listing of cache, which I recently logged, i must do 2 steps. In old version only one. 3) BIGGEST MINUS: I dont see unpublished caches on main site of my profile?? What is it? And OK, when I click on unpublished hides, there I cant see, which are and wchich are not submited for publications. 4) All the lists (unpublished caches, logs, recently viewed caches) are terribe big, so I see much smaller number of caches in concrete list. Thanks for the screenshot. That clears it up for me, and reveals a very serious flaw in the new list. You see, I did in fact visit a TB the day before this came up, but it wasn't on my list. It turns out that the reason it wasn't on my list was because it had scrolled off the bottom already. OK, fine, and mainly that's because of all the friend listings that I don't want to see anyway. But what I realize looking at your screen shot is that the most important reason it scrolled off the list is that TB visits are listed last. Before, they were listed chronologically, so the TB visit log was always next to the found log that created it. I could see those found logs, so when the TB logs weren't next to them, I assumed it was because TB visits are listed at all. Anyway, long story, short bug report: the "recent logs" should be ordered chronologically so that TB logs are right next to the found log that generated them. Agree 100%, I always review my logs on the dashboard at the end of the day, and it's obvious if I forgot to log a TB drop, when I see there's no drop log beside the cache I found and there have been several occasions when this has reminded me to log a TB drop that I had skipped. If the TB logs are separated from the cache logs that will be less obvious that a TB drop has been missed. I liked having all my custom profile information prominently displayed. Why did you change the default display? We learned through data that only 2.4% of active geocachers have anything entered in their custom profile information tab. It makes for an inconsistent experience if most people land on an empty page. The ‘geocaches’ tab is relevant to everyone who plays the game. We could add an “empty state” (a bit of information that tells you what you are missing out on and how to add content, if you currently have none) on the page for those who don’t have any content, but all of that code is part of our legacy (aka: spaghetti) code base and we run the risk of breaking the custom content for the people who do have it on their profile. So we end up playing the balance game of keep the content available, but shift location or build something that is relevant to everyone and risk breaking it. We’ll look at community feedback and use of the page after this release to help us determine next steps. Is the "inconsistent experience" really the only issue? Or are you interested in a better experience? Because I think displaying the personal information in the "About" tab is going to be a much better experience whenever the user has taken the time to enter this information. If you don't want to display a blank "About" tab (and I agree that a placeholder "About" tab is really no better than a blank one), then perhaps you could make the "About" tab optional. If the user has taken the time to enter this information, then the "About" tab would display as the first tab on the left, and it would display as the default tab. 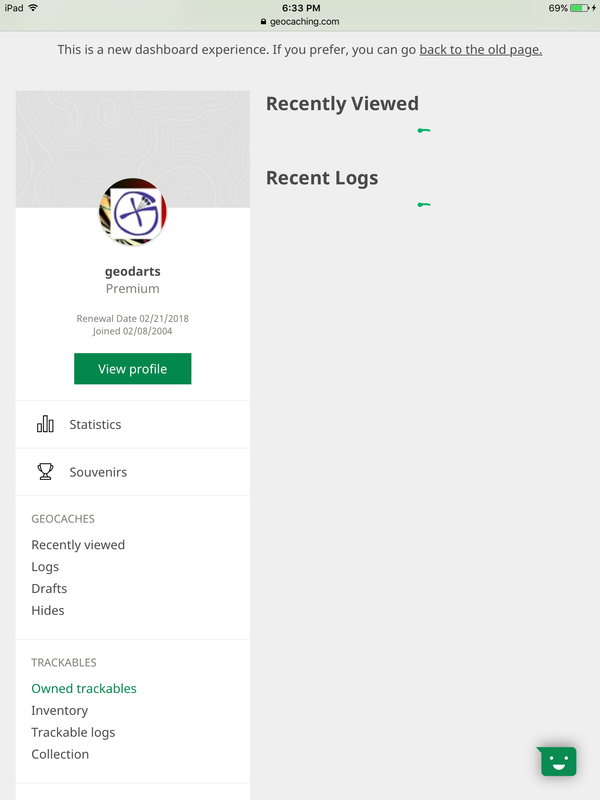 But if the user hasn't entered anything, or if the user has removed the personal information, then the "About" tab would not display, and the "Geocaches" tab would be the leftmost (and default) tab. Others have mentioned performance issues, usually related to users who have gone to extremes with their custom statistics/souvenirs, and/or who are using slow third-party servers for their custom statistics/souvenirs. Perhaps another optional tab could be created for "Personal Statistics" or "Trophies" or whatever. 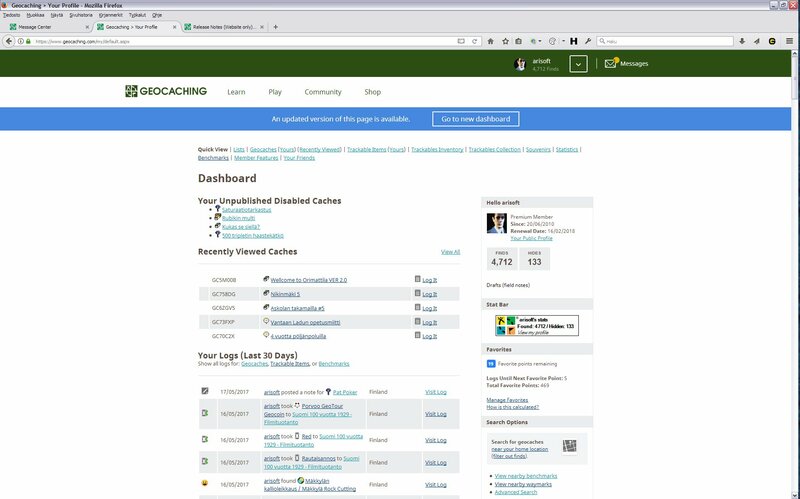 Then the "About" tab could be used for general personal information, and the other tab could be used for detailed statistical analysis of the user's entire geocaching career. I don't know how the idea of optional tabs would play with your legacy/spaghetti code. But I would think that a binary toggle wouldn't be any more trouble than rearranging tabs and changing which tab is the default. As some of you are painfully aware, if you tried to view the Dashboard on a tablet you would see the loading spinners for eternity. This was a bug that got introduced just before launch and was overlooked, but has now been fixed. I am sorry that bug wasn't caught sooner and thank you all for your understanding. For those of you who are familiar with software process you know that it is not uncommon for bugs to find their way into a system. We do our best to bring the number as close to zero as possible before anything is released and fix the remaining bugs as quickly as possible. * The new profile and dashboard are intended as a work in progress to allow community feedback along the way and while we would love hearing from the community about the new pages we are not forcing anyone to use the new pages. In fact a lot of work went into a new system to make sure your preferences are "sticky". If you choose to view an old page then that is what you will see. The development process for this project is going to be different than in the past. We know that in the past some projects have been released and then it is perceived that we have abandoned them, leaving the community to use (or not) something that they didn't want. With that in mind I understand why so many people would be weary of these changes that seem so drastic and "unpolished". We are trying to communicate our intentions as often and in as many places as possible. Jayme and I plan on being transparent and open about changes so everyone is aware of what is coming up. Thanks again HiddenGnome for keeping us updated! I'd really like to see a direct link to the map on the dashboard. The dashboard is my landing page for GC.com, and the map icon is the thing I use most, so I'd like to see a link on the page rather than having to go via the drop down menus - after all there's enough empty space to fit it in. It is quite refreshing to hear this. I have often felt in the past that HQ has made a bunch of changes and then not said anything else about it, even though people are providing feedback and talking about the things they don't like. Thank you for being open and honest with us and for keeping us updated. It looks awful on a 20" horizontal monitor - far too much space and I have to scroll to see anything. The biggest single issue I have is with my friends logs. I gather that this will be configurable, so may I request that each friend has an on/off switch and that each category of log has an on/off switch. So, I can specify that I don't want to see any logs from some friends and just cache logs from other friends. No trackable logs from any friends. The other bug(?) is the "Log this cache" link doesn't take me to the "Log this cache" page - it takes me to the cache description page, just like clicking the cache name. Three lines of information for my recently viewed caches is unnecessary. If I've looked at them recently I know what they are. The number of favorites, the distance, the D/T values and cache size are redundant. One line (cache type and name) at 1 1/2 spaced text would be better. Similarly, why two lines of data for friends logs. Move cache type and name beside the friends name and make it 1 1/2 spaced as well. Even better, segregate each friend's logs into their own (collapsible) area, so their name only needs to appear once. The dates from my friend's logs - are they local time to me, local time to where my friend logged the cache or Seattle time? Having the settings link beside the Logs header is bizarre. It should be in the left panel along with Souvenirs and statistics. Taliking of the left panel, it would be great if the links below the Geocaches and Trackables headings simply collapsed and expanded the relevant section to the right. Remembering the collapsed/expanded state between runs would also be good. Or, default them all to collapsed at the start of each run. The dashboard now works on my tablet and looks fair to middling when the tablet is in portrait mode. BTW, This might be a time to mention that the TripAdvisor app is really insistent about you rotating the device to landscape mode. I'm boss of my devices; I uninstalled the app. EDIT: Guess I should mention, this is a Nexus 7 (2013) with the current Firefox. The script error was on the screen after I wrote up this post, then went back to the tablet a few minutes later. I've looked at the profile now and I have to say that I don't like it. Far too much wasted space. For my profile, move the finds, hides, trackables, "View forum posts" and the settings up to the right of the picture, centre the name and member status below the picture and move the "Joined" and "Last visited" bits to the right, immediately below the hides, etc. For other people's profiles, move the box containing friends, send message, send e-mail and View Forum posts up to the right of their picture as well. I don't want to see peoples geocaches by default - I want to see their "about" tab. Other folk will have different preferences, so please allow us to specify which tab is our default view (or to allow us to select that no tab should be shown). When I add my picture, it is square. Why do you crop it to a round shape. If I wanted round (or oval or star-shaped or whatever), i would have uploaded it that way. Please let our picture reflect what we want. These are both great things!